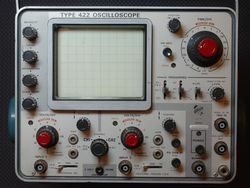 The Tektronix Type 422 is a 15 MHz portable dual-trace oscilloscope introduced in 1966. It was available with an optional battery back for operation without mains power. The post-deflection acceleration voltage is 4900 V.
Early versions use an 8056 Nuvistor tube for the front-end cathode follower. Later versions use a FET front end. The 8056 Nuvistor used in the input amplifier of the 422 can be replaced by a MPF102 JFET. The trigger circuit in the 422 has a trigger amplifier driving a 1N3719 tunnel diode, D375, which acts as a Schmitt trigger. The trigger amplifier has a nonlinear deadband diode circuit in the negative feedback path. What results is high gain for small signals (little or no negative feedback) and low gain for large signals (strong negative feedback). Thus, the signal at the base of Q364 has a limited swing over a wide range of input amplitudes. The collector current of Q364 varies between 0 and 9 mA. Depending on the position of the trigger slope control, higher collector current in Q364 either switches D375 from the low-voltage state to the high-voltage state or from the high-voltage state to the low-voltage state. When D375 transitions from the low-voltage state to the high-voltage state, it produces a current pulse in the primary of transformer T401, which produces a current pulse in the secondary of T401. The secondary of T401 feeds another tunnel diode, D405, and the current pulse switches D405 to the high-voltage state, which starts a sweep. The 422 uses the T4220 CRT. This page was last edited on 31 March 2019, at 07:47.